Since her Eyebeam residency, alum Marina Zurkow has continued to explore the intersections of nature and culture through participatory and collaborative works in diverse media. Her most recent projects engage participants–and the public–to examine their relationship to natural ecosystems and how we are effecting/should be effecting change. Eyebeam discussed with her her current work and methodology. Eyebeam: A lot of your recent projects are collaborative with other artists & researchers. 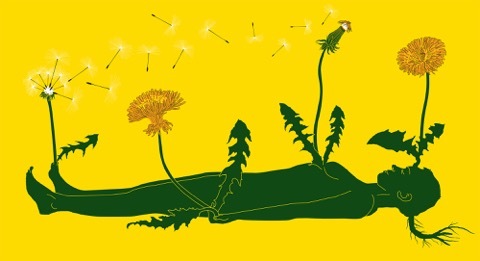 What do you feel is important about this type of collaboration (in projects/collectives like Dear Climate, FSDE, Making the Best of It: Dandelion, Investing in Futures, and others)? Marina Zurkow: Collaborations mean multiple brains, visions, skills, and critique are built into the process. I am lucky to have found common interests and energy with people who are nimble and imaginative, and come from a variety of disciplines: writing, theory, theater, geography, design, data, agroecology. Scheduling is hard. But it can mean more output, and sharing of all aspects of the work (pleasurable, challenging, and egregious). Eyebeam: Additionally, you make a lot of interactive works that require outsider participation–what kind of reach do you think these kinds of projects have/should have to make an impact? How much intimacy and how long a time commitment are we asking of participants? What do we hope they’ll take with them when they leave? Is there a possibility for them to be a node in further distribution? Can we speculate on unknown or uncontrolled consequences, and build in open questions that sustain interest, and offer feedback and learning? Some of the sequencing we have done on projects includes a face to face experience, souvenirs of that experience, and outputs that can be easily shared. A project like Investing in Futures (in collaboration with Sarah Rothberg, Surya Mattu) is designed with two tracks: one, a standalone deck of cards that people will hopefully use both according to our rules and with their own mutations/inventions, and the other, a highly designed workshop context that we lead. Our experiments as the collective More&More Unlimited are designed to push at user participation from designing swimsuit textiles to creating prototypes of future meals and artifacts. Making the Best of It: Dandelion (in collaboration with Valentine Cadieux) operated in Minnesota over the past 16 months in several frameworks: within Northern Spark’s large public art festivals in June 2016 and 2017, we served a relatively large public (about 600 people over the course of each night-long event) but within the context of the festival, to which 20,000 people come, that’s a small group. Our interest, somewhat contrarily, was to create intimacy and a shelter from spectacle, by demanding a time commitment from participants through sequenced interaction design. During the interim winter, we created potluck situations in which 6 – 20 people participated. These functioned quietly and were emergent and open-ended, and we saw them both as events and also as opportunities to playtest parts of the larger public design work. Now that this project is over, and born out of this research, we are developing DIY kits that offer both material supplies and frameworks to host one’s own nimble food systems potluck and/or memorial wakes. Eyebeam: How do you see your work questioning the relationship between the natural world and humanity/culture, and what do you make of this relationship as we move forward into an (even more) environmentally unsure future? MZ: In my opinion, we’re in a psychic state of emergency. Regulation can be enforced on a population, but there’s compliance and the predictably fickle forces of politics. Environmental justice is still considered opt in by many whose crises are more immediate. If the earthly, embodied and enmeshed paradigms don’t evolve beyond the nature/culture binary – what anthropologist Eduardo Kohn calls “beyond the human” (as opposed to the post-human or non-human) – the apparently inexorable machines of capital (and “logistics”) will continue to burn without regard to equitable or critical limits. I feel self-conscious that this statement is totally obvious to Eyebeam’s community. But the question is: how do paradigm shifts occur, and how do artists contribute to those? And this goes back to the (my) panic produced by your previous question of reach: can I as an artist have impact if my reach is small and my projects involve significant yet often ignored (marginalized or invisible) subjects? A Field Guide to the Dark Ecologies of Newtown Creek and the related work we do as Floating Studio for Dark Ecologies (FSDE — a collaboration with Nicholas Hubbard, Rebecca Lieberman) tries to directly and sensorially engage people in issues of ecological equity, observation, stewardship and participation in political and volunteer processes in a very local ecosystem — as invisible as Newtown Creek is to most, and as insidious as the toxins are, that have accumulated in this maligned and post-naturally beautiful waterway. This work both hopes to bring new members into the Newtown Creek discourse (its fate is still in assessment by the as-yet still-functioning EPA), as well as serve as a model for communities to open up to their own complex social/ecological systems. Eyebeam: Could you explain the theory behind your Dear Climate project and what it says about climate change? Who do you see as the audience for this? MZ: Dear Climate (in collaboration with Una Chaudhuri, Oliver Kellhammer and Fritz Ertl) is framed as a set of tools designed to nudge one’s “inner climate” toward opening new relations. We appropriated psychic and political tools of change that can be apprehended at a variety of time frames through distinct modes of address: agit-prop posters (quick and public, in which “you” is everyone), audio meditation instruction (slow and contemplative in which “you” is a human individual), and letter-writing from non-human perspectives (the personal as political; “you” as an imaginary author and recipient — a non-human writing to the climate). These new relations include more fully facing and rethinking survival, an important part of which we feel is befriending uncertainty, climatic change and the greater-than-human world. We welcome publics to download the materials and freely distribute them. We offer workshops involving group meditation and letter writing sessions. 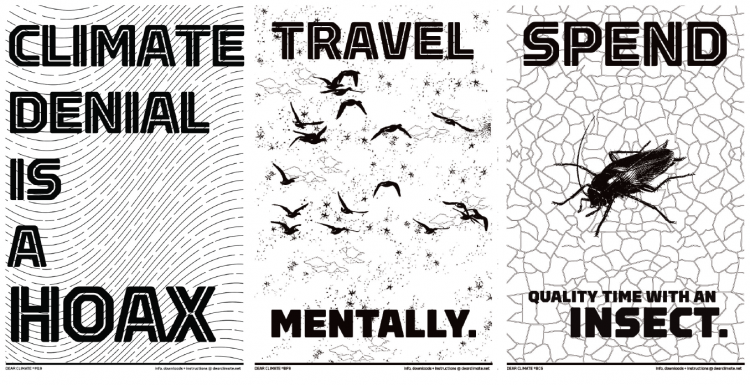 We have used the posters in the contexts of art exhibitions, school hallways, and environmental protests. We encourage people to shop-drop the posters at airport magazine stands and into big box store circulars. Eyebeam: You use a lot of non-traditional mediums for creating art, notably including dinners. Can you explain some of the ideas behind these diverse artistic mediums? MZ: After several years of focus primarily on animation projects, I am all over the place. This is a way of opening up my own process, less concerned with mastery and closed forms of authorship, and more open to process as experimentation. The why — why I have leaned toward using dinners, snacks, workshops, and walks — is a self-critical response to the kinds of pictorial space I was producing. While these animated picture spaces are a way of understanding the world and positing new ones, they possess both the benefits and the limits of enchantment — a form of detached interest, and one whose backstories are inferred but never explicit. They are also understood primarily with one’s eyes, not taste buds or moving feet, which are epistemological forms I am keenly interested in exploring. More information about Marina Zurkow’s work can be found on her website. Article by Communications Intern Amber Parris. All photos courtesy of the artist. 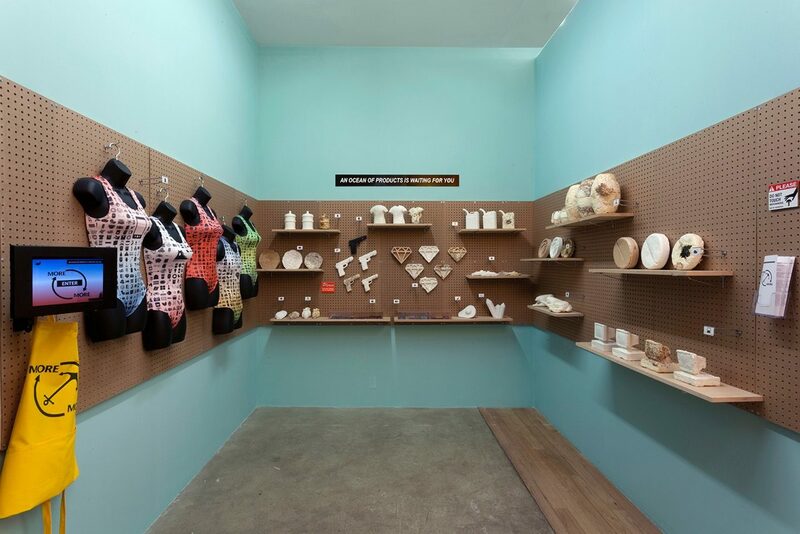 Header image: Marina Zurkow and More&More Unlimited (Sarah Rothberg, Surya Mattu, and Marina Zurkow), “The More and More Store,” installation of website, swimsuits, global export objects (fungus, wood, plant cellulose, plaster, chocolate, and soap), shelving, 2016.